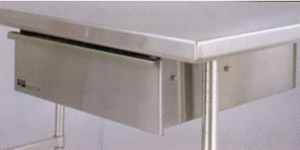 Built for cleanliness and stability. 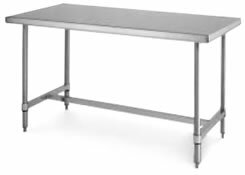 Seamless 14-gauge Type 304 stainless steel work surface and support structure. Shipped knocked down and can be assembled in minutes without tools. 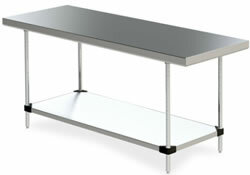 All Work Tables are 34" (864mm) high with stationary posts and leveling feet. Click the Model No. of the item you wish to purchase. 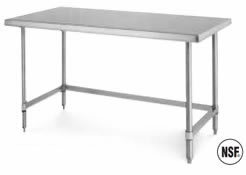 Stainless Steel Work Tables, Heavy Duty Work Tables, Benches, Work Table, Industrial Work Tables, Mixer Stands, Mixer Tables, Stainless Steel Benches, Stainless Steel Tables, and Work Tables from your source for material handling equipment.